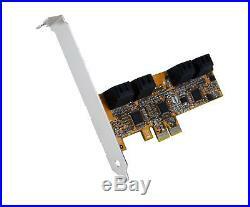 ExSys EX-3517 -PCI-Express Card SATA 3 PCIe (x2) Controller for four HDD and SSD. The description of this item has been automatically translated. Your specialist for computer accessories. PCI-Express card SATA 3 PCIe (x 2) controller. For four HDD and SSD drives. Price: 69,49 EUR. EX-3517 – PCI-Express card SATA 3 PCIe (x 2) Controllerfür four HDD and SSD drives. The EX-3517 is a powerful SATA3 controller on the basis of the new PCI-Express tech-technology. He supports no RAID. The EX-3517 has 4 internal SATA3 connections for SATA 2 / 3 and SSD hard drives. It offers the optimal solution, SATA3 devices on a PCI-Express slot (x 2) to connect. With the EX-3517 is a low profile bracket for slim computer case supplied up to 8 cm height. Unterstützt 2-Lane 5Gbps PCI-Express Gen2 Bus No RAID support function Compatible with SATA / SATA 2 / 3 and SSD hard drives Works simultaneously with SATA hard disks by the mother board Supports serial ATA AHCI spec. 1.3 Operating of individual hard drives without RAID possible Supports up to 6 TB hard drives Can be booted from the EX-3517 Specifications. · Chipset: ASMEDIA 1062 + JMicro JMB 575S · Data transfer rate: up to 6.0 GB / s · Ports: 4 internal 7 pin SATA3 · Operating Systems: Windows XP/ Vista/ Win7/ 8. X/ Win10 (32&64bit), Server 2008, 2012 und 2012R2 · Hardware system: PCI Express x2 to x16 Slot · Power supply: 3.3 volt PCI-Express slot · Operating temperature: 0 ° C to 55° Celsius · Storage temperature:-40 ° C to 75° Celsius · Relative humidity. 5% to 95% · Dimensions: 79 x 48 mm · Weight: 350g. EX-3517 4x SATA cable Low Profile bracket Driver CD Manual. Public institutions, banks and large companies can be supplied after consultation on open account. With EU foreign customers with valid VAT ID, it can be deducted. Public institutions, banks and large companies may be supplied after consultation on open account. Thank you very much. You transfer the invoice amount. You can check the status of your order at any time online. Goods can be collected from us by arrangement with pleasure. Please agree To set a date. An appointment is required. Thus, we want to make an additional contribution to the environment. You have the right to withdraw from this contract within fourteen days without giving a reason. To exercise your right, you have to. INTEGRATE COMPUTER Office 407 Rödelheimer Highway 75-85 60487 Frankfurt. Fax: 069/977 62 577 Tel: 069/977 62 501. You can sure use the attached model withdrawal form which is not mandatory, however. In order to observe the revocation period it is sufficient for you to send the message about the right of withdrawal before the withdrawal deadline. Wenn Sie diesen Vertrag widerrufen, haben wir Ihnen alle Zahlungen, die wir von Ihnen erhalten haben, einschließlich der Lieferkosten (mit Ausnahme der zusätzlichen Kosten, die sich daraus ergeben, dass Sie eine andere Art der Lieferung als die von uns angebotene, günstigste Standardlieferung gewählt haben), unverzüglich und spätestens binnen vierzehn Tagen ab dem Tag zurückzuzahlen, an dem die Mitteilung über Ihren Widerruf dieses Vertrages bei uns eingegangen ist. Für diese Rückzahlung verwenden wir dasselbe Zahlungsmittel, dass Sie bei der ursprünglichen Transaktion eingesetzt haben, es sei denn, mit Ihnen wurde ausdrücklich etwas anderes vereinbart; in keinem Fall werden Ihnen wegen dieser Rückzahlung Entgelte berechnet. Wir können die Rückzahlung verweigern, bis wir die Waren wieder zurückerhalten haben oder bis Sie den Nachweis erbracht haben, dass Sie die Waren zurückgesandt haben, je nachdem, welches der frühere Zeitpunkt ist. Sie haben die Waren unverzüglich und in jedem Fall spätestens binnen vierzehn Tagen ab dem Tag, an den Sie uns über den Widerruf dieses Vertrages unterrichten, an uns zurückzusenden oder zu übergeben. Die Frist ist gewahrt, wenn Sie die Waren vor Ablauf der Frist von vierzehn Tagen absenden. Sie tragen die unmittelbaren Kosten der Rücksendung der Waren. Sie müssen für einen etwaigen Wertverlust der Waren nur aufkommen, wenn dieser Wertverlust auf einen zur Prüfung der Beschaffenheit, Eigenschaften und Funktionsweise der Waren nicht notwendigen Umfang mit ihnen zurückzuführen ist. Note on Non-existence of withdrawal right. If you want to cancel the contract, please fill out this form and send it in. INTEGRATE COMPUTER, Office 407, 75-85, 60487 Frankfurt, City Road. Signature / consumer (s) (only with message on paper) _________________________. On request we deliver all Products of Exsys, Moxa and InLine Companies. Thus, problems can be resolved to your satisfaction as quickly as possible and we ask you in such cases always immediately our staff at the service hotline to contact. Your satisfaction is our top priority! Could we satisfy you with our products? Then rate us in all categories with 5 stars! PCI Express x2 bis x16. The item “ExSys EX-3517 -PCI-Express Card SATA 3 PCIe (x2) Controller for four HDD and SSD” is in sale since Tuesday, September 19, 2017. This item is in the category “Computers/Tablets & Networking\Computer Components & Parts\Interface/Add-On Cards\Disk Controllers/RAID Cards”. The seller is “int-computer” and is located in Frankfurt. This item can be shipped worldwide. Your specialist for computer accessories. Exsys EX-3509-PCI-Express card SATA III for up to 8 HDD and SSD drives. Price: 113,65 EUR. EX-3509 – PCIe SATA 3 controller without RAID function with 8 internal SATA3 connections, including LP ironing (AsMedia chip-set). The EX-3509 is a powerful SATA 3 controller with 8 internal SATA 3 ports based on the new PCI Express technology. The EX-3509 supports any RAID function. In any computer which provides a PCI-Express slot 3 devices such as hard disk, SSD, or DVD can be connected therefore to internal SATA further to 8 drives, etc.. EX-3509 different drivers are supplied with for most loading drive systems. The EX-3509 a low supplied with profile bracket for Slim PC housing 8 cm height. PCI-Express controller with eight internal SATA 3 double deck connections Unterstützt x1 Bus mit 2.5 und 5Gbps PCIe Gen2 No RAID support function Compatible with SATA / SATA 2 / 3 and SSD hard drives Works simultaneously with SATA hard disks by the mother board Supports serial ATA AHCI spec. 1.3 Operating of individual hard drives without RAID possible Supports up to 6 TB hard drives Can be booted from the EX-3509 Including low profile bracket Specifications. · Chipset: ASMEDIA 1062 + JMicro JMB 575S · Data transfer rate: up to 6.0 GB / s · Ports: 8 internal 7 pin SATA3 · Operating Systems: Windows XP/ Vista/ Win7/ 8. X/ Win10 (32&64bit), Server 2008, 2012 und 2012R2 · Hardware system: PCI-Express x1 to x16 Slot · Power supply: 3.3 volt PCI-Express slot · Operating temperature: 0 ° C to 55° Celsius · Storage temperature:-40 ° C to 75° Celsius · Relative humidity. 5% to 95% · Dimensions: 126.00 x 48.00 mm · Weight: 550g. EX-3509 8 x SATA cable Low Profile bracket Driver CD Manual. Public institutions, banks and large companies can be supplied after consultation on open account. With EU foreign customers with valid VAT ID, it can be deducted. Public institutions, banks and large companies may be supplied after consultation on open account. Thank you very much. You transfer the invoice amount. You can check the status of your order at any time online. Goods can be collected from us by arrangement with pleasure. Please agree To set a date. An appointment is required. Thus, we want to make an additional contribution to the environment. You have the right to withdraw from this contract within fourteen days without giving a reason. To exercise your right, you have to. INTEGRATE COMPUTER Office 407 Rödelheimer Highway 75-85 60487 Frankfurt. Fax: 069/977 62 577 Tel: 069/977 62 501. You can sure use the attached model withdrawal form which is not mandatory, however. In order to observe the revocation period it is sufficient for you to send the message about the right of withdrawal before the withdrawal deadline. Wenn Sie diesen Vertrag widerrufen, haben wir Ihnen alle Zahlungen, die wir von Ihnen erhalten haben, einschließlich der Lieferkosten (mit Ausnahme der zusätzlichen Kosten, die sich daraus ergeben, dass Sie eine andere Art der Lieferung als die von uns angebotene, günstigste Standardlieferung gewählt haben), unverzüglich und spätestens binnen vierzehn Tagen ab dem Tag zurückzuzahlen, an dem die Mitteilung über Ihren Widerruf dieses Vertrages bei uns eingegangen ist. Für diese Rückzahlung verwenden wir dasselbe Zahlungsmittel, dass Sie bei der ursprünglichen Transaktion eingesetzt haben, es sei denn, mit Ihnen wurde ausdrücklich etwas anderes vereinbart; in keinem Fall werden Ihnen wegen dieser Rückzahlung Entgelte berechnet. Wir können die Rückzahlung verweigern, bis wir die Waren wieder zurückerhalten haben oder bis Sie den Nachweis erbracht haben, dass Sie die Waren zurückgesandt haben, je nachdem, welches der frühere Zeitpunkt ist. Sie haben die Waren unverzüglich und in jedem Fall spätestens binnen vierzehn Tagen ab dem Tag, an den Sie uns über den Widerruf dieses Vertrages unterrichten, an uns zurückzusenden oder zu übergeben. Die Frist ist gewahrt, wenn Sie die Waren vor Ablauf der Frist von vierzehn Tagen absenden. Sie tragen die unmittelbaren Kosten der Rücksendung der Waren. Sie müssen für einen etwaigen Wertverlust der Waren nur aufkommen, wenn dieser Wertverlust auf einen zur Prüfung der Beschaffenheit, Eigenschaften und Funktionsweise der Waren nicht notwendigen Umfang mit ihnen zurückzuführen ist. Note on Non-existence of withdrawal right. If you want to cancel the contract, please fill out this form and send it in. INTEGRATE COMPUTER, Office 407, 75-85, 60487 Frankfurt, City Road. Signature / consumer (s) (only with message on paper) _________________________. On request we deliver all Products of Exsys, Moxa and InLine Companies. Thus, problems can be resolved to your satisfaction as quickly as possible and we ask you in such cases always immediately our staff at the service hotline to contact. Your satisfaction is our top priority! Could we satisfy you with our products? Then rate us in all categories with 5 stars! The item “Exsys EX-3509 PCI Express Card SATA III for up to 8 HDD and SSD Drives” is in sale since Wednesday, August 12, 2015. This item is in the category “Computers/Tablets & Networking\Computer Components & Parts\Interface/Add-On Cards\Disk Controllers/RAID Cards”. The seller is “int-computer” and is located in Frankfurt. This item can be shipped worldwide. Votre spécialiste en accessoires informatiques. 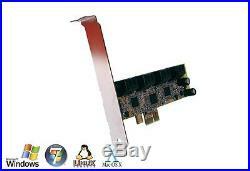 EXSYS EX-3509-PCI-Express carte SATA III pour jusqu’à 8 disques SSD et HDD. Prix : EUR 113,65. Description de l’article. EX-3509 – contrôleur PCIe SATA 3 sans function du RAID 8 connexions SATA3 internes, y compris LP repassage (AsMedia chip-set). LEX-3509 est un puissant contrôleur SATA 3 avec 8 ports SATA 3 internes basé sur la nouvelle technologie PCI Express. LEX-3509 prend en charge toutes les fonctions RAID. Dans nimporte quel ordinateur qui fournit un dispositifs de fente 3 PCI-Express comme disque dur, SSD, ou DVD peut être connecté par conséquent à SATA interne à la suite de 8 disques, etc… EX-3509 pilotes différents sont fournis avec pour la plupart en voiture systèmes de chargement. LEX-3509 un minimum fourni avec le support de profil pour PC Slim logement 8 cm de hauteur. PCI-Express contrôleur avec huit connexions internes du pont double SATA 3 Unterstützt x1 Bus mit 2.5 und 5Gbps PCIe Gen2 Fonction de soutien sans RAID Compatible avec SATA / SATA 2 / 3 et les disques durs SSD Fonctionne simultanément avec disques durs SATA de la carte mère Spec de ATA AHCI Supports série. 1.3 Exploitation des disques durs individuels sans possible RAID prend en charge jusqu’à 6 to de disques durs Peut être démarré à partir de lEX-3509 y compris extra-plat Caractéristiques. · Chipset : ASMEDIA 1062 + JMicro JMB 575S · Taux de transfert de données : jusqu’à 6,0 Go / s · Ports : 8 internes 7 broches SATA3 · Systèmes d’exploitation: Windows XP/ Vista/ Win7/ 8. X/ Win10 (32&64bit), Server 2008, 2012 und 2012R2 · système de Hardware: PCI-Express x1 à x16 · Alimentation: fente de 3,3 volts PCI-Express · Température de fonctionnement : 0 ° C à 55° c · Température de stockage :-40 ° C à 75 ° c · Humidité relative. 5% à 95% · Dimensions : 126.00 x 48,00 mm · Poids: 550g. EX-3509 8 x câble SATA Low Profile support CD de pilotes Manuel. Pour chaque livraison, vous aurez bien sûr de recevoir une facture avec TVA. Les institutions publiques, les banques et les grandes entreprises peuvent être fournis après consultation sur compte ouvert. Avec des clients étrangers de l’UE avec numéro de TVA valide, il peut être déduit. Après avoir dûment consulté, les expéditions vers les institutions publiques, les banques et les grandes entreprises peuvent être faites sur une base de compte ouvert. S’il vous plaît faire surethat que vous avez de comprendre notre description de l’article avant de l’acheter avec le Acheter maintenant option. Vous transférez le montant de la facture. Vous recevrez nos coordonnées bancaires après notre achat. Vous pouvez vérifier l’état de votre commande en ligne en tout temps. Vous payez à la réception du montant de la facture pour la livraison de colis de livraison. Si vous payez par des frais supplémentaires trésorerie peut demander, s’il vous plaît vous référer à notre Versanangaben out. Les marchandises peuvent être recueillies auprès de nous par arrangement avec plaisir. S’il vous plaît accepter Pour fixer une date. Un rendez-vous est nécessaire. Ainsi, nous voulons apporter une contribution supplémentaire à lenvironnement. Vous avez le droit de se retirer de ce contrat dans les quatorze jours sans donner de raison. Le délai de rétractation est de quatorze jours à compter de la date, qui ont pris les biens finaux en possession d’acheter ou indiqués par vous tiers autre que le transporteur ou a. Pour exercer votre droit, vous devez. INTÉGRER DU MATÉRIEL d’informationsRMATIQUE Bureau 407 Rödelheimer autoroute 75-85 60487 Francfort. Fax : 069/977 62 577 Tél : 069/977 62 501. Vous pouvez vous utiliser le modèle de formulaire de rétractation joint qui n’est pas obligatoire, cependant. Afin de respecter le délai de révocation, il suffit pour vous d’envoyer le message au sujet du droit de rétractation avant la date limite de retrait. Effets de la rétractation. Wenn Sie diesen Vertrag widerrufen, haben wir Ihnen alle Zahlungen, die wir von Ihnen erhalten haben, einschließlich der Lieferkosten (mit Ausnahme der zusätzlichen Kosten, die sich daraus ergeben, dass Sie eine andere Art der Lieferung als die von uns angebotene, günstigste Standardlieferung gewählt haben), unverzüglich und spätestens binnen vierzehn Tagen ab dem Tag zurückzuzahlen, an dem die Mitteilung über Ihren Widerruf dieses Vertrages bei uns eingegangen ist. Für diese Rückzahlung verwenden wir dasselbe Zahlungsmittel, dass Sie bei der ursprünglichen Transaktion eingesetzt haben, es sei denn, mit Ihnen wurde ausdrücklich etwas anderes vereinbart; in keinem Fall werden Ihnen wegen dieser Rückzahlung Entgelte berechnet. Wir können die Rückzahlung verweigern, bis wir die Waren wieder zurückerhalten haben oder bis Sie den Nachweis erbracht haben, dass Sie die Waren zurückgesandt haben, je nachdem, welches der frühere Zeitpunkt ist. Sie haben die Waren unverzüglich und in jedem Fall spätestens binnen vierzehn Tagen ab dem Tag, an den Sie uns über den Widerruf dieses Vertrages unterrichten, an uns zurückzusenden oder zu übergeben. Die Frist ist gewahrt, wenn Sie die Waren vor Ablauf der Frist von vierzehn Tagen absenden. Sie tragen die unmittelbaren Kosten der Rücksendung der Waren. Sie müssen für einen etwaigen Wertverlust der Waren nur aufkommen, wenn dieser Wertverlust auf einen zur Prüfung der Beschaffenheit, Eigenschaften und Funktionsweise der Waren nicht notwendigen Umfang mit ihnen zurückzuführen ist. Remarque sur la non-existence d’un droit de retrait. Le droit ne concerne pas les contrats à distance pour la livraison des enregistrements audio ou vidéo ou de logiciels informatiques dans un emballage scellé, si le joint a été enlevé après l’accouchement. Modèle de formulaire de rétractation. Si vous souhaitez annuler le contrat, sil vous plaît remplir ce formulaire et envoyez-le. INTÉGRER lordinateur, 60487 Francfort, bureau 407, 75-85, route de la ville. Signature / consommateur (s) (uniquement avec le message sur papier) _________________________. Supprimer le cas échéant. Sur demande, nous livrons tous Produits des sociétés exSys, Moxa et InLine. Ainsi, les problèmes peuvent être résolus à votre satisfaction le plus rapidement possible et nous vous demandons, dans ces cas toujours immédiatement notre personnel au service d’assistance technique à contacter. Votre satisfaction est notre priorité! Nous pourrions vous satisfaire avec nos produits? Puis nous noter dans toutes les catégories avec 5 étoiles! Inscription à la newsletter. The item “EXSYS ex-3509 Carte PCI Express SATA III pour jusqu’à 8 HDD et SSD Drives” is in sale since Thursday, August 20, 2015. This item is in the category “Ordinateur, tablette & réseau\Composants et pièces\Cartes d’extension/réseau\Contrôleurs et cartes RAID”. The seller is “int-computer” and is located in Frankfurt. This item can be shipped worldwide. Exsys EX-3508 – PCIe SATA II Controller (8 HDD & DVD Laufwerke). EX-3509 – SATA 3 PCIe Controller für acht HDD und SSD Drives. Marken Ware zum kleinen Preis! Gruppe: Controller / PCI-Express / Serial-ATA II / Add-On. PCIe SATA 3 Controller für bis zu 8 Festplatten & SSD. Der EX-3509 ist ein leistungsfähiger SATA 3 Controller mit 8 internen SATA 3 Anschlüssen auf Basis der neuen PCI-Express Technologie. Der EX-3509 unterstützt keine RAID Funktion. In jedem Rechner der einen PCI-Express Slot zur Verfügung stellt kann somit bis zu 8 weiteren internen SATA 3 Geräte z. Festplatten, SSD oder DVD Laufwerke usw. Es werden mit dem EX-3509 verschiedene Treiber mitgeliefert für die meisten Be-triebssysteme. Mit der EX-3509 wird ein Low Profile Bügel mitgeliefert für schmale PC Gehäuse von 8cm Bauhöhe. PCI-Express Controller mit 8 internen SATA III Doppel-Deck Anschlüssen Unterstützt x1 Bus mit 2.5 und 5Gbps PCIe Gen2 Unterstützt keine RAID Funktion Kompatibel zu SATA / SATA 2/3 und SSD Festplatten Arbeitet gleichzeitig mit SATA Festplatten vom Mother-Board Unterstützt Serial ATA AHCI Spec. 1.3 Betrieb einzelner Festplatten ohne RAID möglich Unterstützt Festplatten bis 6TB Kann von der EX-3509 gebootet werden Inklusive Low Profile Bügel. Chip-Set: ASMEDIA 1062 + JMicro JMB 575S Datentransfer-Rate: bis 6.0Gb/s Anschlüsse: 8 x Intern 7 Pin S-ATA 3 Hardwaresysteme: PCI-Express x1 bis x16 Slot Treiber: Windows XP/ Vista/ Win7/ 8. X/ 10 (32&64bit) Server 2008, 2012 und 2012R2 Betriebstemperatur : 0 bis 55 Celsius Rel. Luftfeuchtigkeit: 5% bis 95% Stromversorgung: 3,3 Volt über PCI-Express Slot Abmessung: 126 x 48 mm Gewicht: 800g. EX-3509 8 x S-ATA Kabel Low Profile Bügel Treiber CD Handbuch. Auf Anfrage liefern wir alle Produkte der Firma EXSYS. SATA 3 PCIe (x1) Controller for eight HDD and SSD drives. The EX-3509 is the most powerful SATA 3 Host Adapter Card to accommodate up to 8 SATA 3 hard drives with the new technology of PCI Express and SATA 3 serial data streaming. Any system with a PCI Express interface can add the SATA devices by simply adding the EX-3509 PCIe card and loading the drivers into the system. The EX-3509 supports up to 8 internal SATA ports, it supports 8 serial ATA devices such a hard drive, SSD or DVD drives and provides complete software drivers for most of the major operating systems in the market. We include a low profile bracket for small computer case with a maximum height of 8cm. PCI-Express controller with eight internal SATA 3 Double Deck connectors Support 1-lane 2.5 and 5Gbps PCIe Gen2 Bus Dont supports RAID function Compatible to SATA / SATA 2/3 and SSD drives Co-resides with Motherboard SATA devices Support Serial ATA AHCI Spec. 1.3 Can also be used without RAID function for single HDD mode Support hard drives up to 6TB Bootable from the EX-3509 Low Profile bracket included. Chip-Set: ASMEDIA 1062 + JMicro JMB 575S Data transfer rate: up to 6.0Gb/s. Connectors: 8 x internal 7 pin S-ATA 3 Hardware system: PCI-Express Slot x1 up to x16 Driver: Windows XP/ Vista/ Win7/ 8. X/ 10 (32&64bit) Server 2008, 2012 und 2012R2 Operating Temperature : 32 up to 131Fahrenheit Rel. Humidity: 5% to 95% Current Supply: 3.3 Volt via PCI-Express slot Size: 126 x 48 mm Weight: 800g. EX-3509 8 x S-ATA cable Low Profile bracket Driver CD, Manual. Klimaneutraler Versand (DHL GoGreen) Die während des DHL-Transports unserer Pakete entstehenden CO 2 Emissionen werden durch Investition in Klimaschutzprojekte ausgeglichen. The item “Exsys EX-3509 PCI Express Controller SATA III für bis zu 8 HDD und SSD Drives” is in sale since Sunday, April 27, 2014. This item is in the category “Computer, Tablets & Netzwerk\Computer-Komponenten & -Teile\Schnittstellen-/Steckkarten\Festplatten- & RAID-Controller”. The seller is “int-computer” and is located in Frankfurt. This item can be shipped worldwide.